Location: Pinacoteca Apostolica, Vatican, Rome. For explanations of other pictures, see: Famous Paintings Analyzed. Commissioned in 1517 by Cardinal Giulio de' Medici (1478-1534) (of the Florentine Medici Family) - shortly to become Pope Clement VII (1523-34) - as an altarpiece for the French Cathedral of Narbonne (in competition with The Raising of Lazarus by Sebastiano del Piombo) of which he was Archbishop, this work of religious art was left unfinished by Raphael at his death in 1520, and was completed by his assistants Giulio Romano (1499-1546) and Giovanni Francesco Penni (1496-1536). In the event, the Cardinal kept the painting in Rome and on his accession to the Papacy in 1523, gifted it to the church of San Pietro in Montorio, Rome. In 1774, the new Pope Pius VI (1775-99) had a copy of it made out of mosaic and installed in St. Peter's Basilica. The painting itself was looted by Napoleon in 1797 and taken to Paris, from where it was repatriated in 1815. Raphael's last major work and an undoubted masterpiece of the Italian High Renaissance, it now hangs in the Pinacoteca Apostolica, one of the Vatican Museums. As a result of a major restoration in 1977 by Vatican conservation experts, Raphael's Renaissance colour palette is now fully visible and the painting has regained its pristine splendour. The restoration also dispelled any lingering doubts about the painting's creator. Although unfinished, it was wholly Raphael's work. This painting, a significant contribution to the Renaissance in Rome, illustrates the dual human and divine nature of Christ. The upper part portrays the Transfiguration of Christ, flanked by Moses and Elijah, on Mount Tabor, 10 miles south-east of Nazareth - as recorded in St Mark's Gospel of the Old Testament (9: 2-13). The lower part illustrates the Miracle of the Possessed (Epileptic) Boy, which follows immediately after the Transfiguration (see, for instance, Mark 9: 19). In the Bible, Jesus heals the boy to demonstrate the power of faith and prayer. Using contrasts of light and movement between the two scenes, Raphael combines both these Biblical episodes into one single, spectacular and dramatic painting. Futhermore, numerous preparatory studies by Raphael and his assistants, as well as X-ray analysis of changes made to the painting, demonstrate just what a polished piece of disegno it is. In the upper Transfiguration, the radiant Christ floats in the clouds above the hill, flanked by Moses and Elijah. Below them, lying dazzled and sprawled on the ground, are his disciples. The figure of the floating Jesus is both indicated and acclaimed by gestures of the crowd in the lower section, which thus unite the two halves of the work. Except that, in contrast to the brilliance of the Transfiguration, the lower picture is marked by darkness, as well as the consternation of the apostles who are unable to cure the sick boy. Meanwhile, the expressive bodily gestures and glazed, open-eyed stare of the boy, reveal the awful effects of his condition. Raphael's efforts to capture physical and psychic illnesses through masterful painterly technique are clearly visible both in this figure and in his depiction of the emotional involvement of the boy's parents and other bystanders. This vivid portrayal of human emotion - inspired in part by the Adoration of the Magi (1481, Uffizi Gallery, Florence) by Leonardo da Vinci, and by Titian's Assumption of the Virgin (1518) - influenced many other High Renaissance artists, and - along with the Last Judgment fresco on the altar wall of the Sistine Chapel, by Michelangelo - may be said to have paved the way for the even more expressionistic style of Mannerism. Indeed, some art experts consider that the dramatic tension contained within Raphael's figures, allied to his strong use of chiaroscuro, prefigures the coming style of Baroque painting. 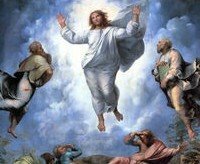 In his famous book Lives of the Artists (1550), the Florentine Mannerist artist and biographer, Giorgio Vasari (1511-74), wrote that The Transfiguration was Raphael's "most beautiful and divine" work. Insofar as the painting (1) promotes the Church - by exalting the redemptive power of Christ, while reminding us of the flaws of man - (2) pays due regard to the creative efforts of the artist's predecessors, and (3) foretells the future development of 16th-century art, one might easily agree with him. On the other hand, one might say that the very emotionalism which makes this work so progressive (one might say its Mannerist Painting tendency) conflicts to some extent with Raphael's signature style of calm gracefulness and harmony of balance, embodied, for example in The School of Athens (1509-13, Stanza della Segnatura, Vatican) - as well as other works in the Raphael Rooms - and The Sistine Madonna (1513-14, Gemaldegalerie Alte Meister, Dresden). Irrespective of which style is most quintessentially Raphael, and despite his slight fall in fashion during this present period of expressionism, he remains without doubt one of the best artists of all time. Raphael is seen as the most significant Renaissance painter of the early 16th century. Called to Rome in 1508 by Pope Julius II, his celebrated religious paintings (including graceful Madonnas, portraits, and mural paintings), are marked by formal clarity and deeply felt expressive power. His unique style was revered and imitated by succeeding generations.  School of Athens (1508) Raphael Rooms, Vatican, Rome.  Sistine Madonna (1513-14) Gemaldegalerie Alte Meister, Dresden.  Portrait of Baldassare Castiglione (1514-15) Louvre Museum, Paris.  Pope Leo X with Cardinals (1513-18) Palazzo Pitti, Florence.  For more about High Renaissance painting in Rome, see our main index: Homepage.